Virgin of Guadalupe Tote Bag - 9 1/2" x 10 1/2"9 1/2" x 10 1/2"
The Virgin of Guadalupe Tote Bag background color is lined with denim and has an aqua macrame shoulder strap. The reverse side has the same image in a predominantly aqua color. The fabric on both sides has metallic gold accents. Hand made in Mexico. This Mexican hand made tote is beautifully adorned with the image of the Virgin of Guadalupe, the handbag is decorated with unique colors and patterns. It is durable and allows you carry groceries with ease and comfort. This tote is not only a trendy item but it also gives you the opportunity to carry an important symbol of your faith anywhere you go. This tote can be used for a variety of things such as carrying groceries, clothes, books and other items such as keys, cell phones or wallets. 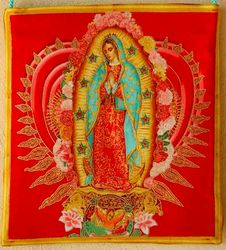 Esta bolsa esta hecha a mano y esta adornado con la hermosa imagen de la Virgen de Guadalupe, la bolsa roja de mano esta decorado con disenos y colores originales y autenticos. Aparte es durable y te permite cargar en ella tu mandado con facilidad y comodidad. Tambien puedes cargar una variedad de cosas aparte del mandado, como ropa, libros y otros articulos como llaves, celulares y carteras.